For this New Moon and Vernal Equinox, the power of the Lunar Cycle at New Moon and the power of the Solar Cycle at Vernal Equinox come together on the same day to offer support. New Moon begins the next Lunar Cycle and is therefore a time to seek Lunar support for new initiatives, and similarly, Vernal Equinox (a day when day and night are of equal length in the Northern Hemisphere, and the days that follow will be longer than the nights) is also a time to seek Solar support for new initiatives. The Lunar Cycle will unfold over one month, and the Solar Cycle will unfold over one year. Tidbits about ceremony and rituals: When working with elemental spirits such as the Sun and Moon, one works through the heart. Ideas arise from the mind and desires arise from the body, but filtering them through the unconventional wisdom of the heart aligns them with a greater purpose than oneself and gives them power to summon support. Ceremony and rituals which may include dance, music, song, poetry, art, prayer/meditation involve the heart, prolong the sound of the call the heart makes, and build a bridge between one tiny individual and the spirits of great beings such as the Moon and Sun. The Tarot spreads for 1) the New Moon and 2) Vernal Equinox reflect the unity of support that the conjunct Moon and Sun offer. 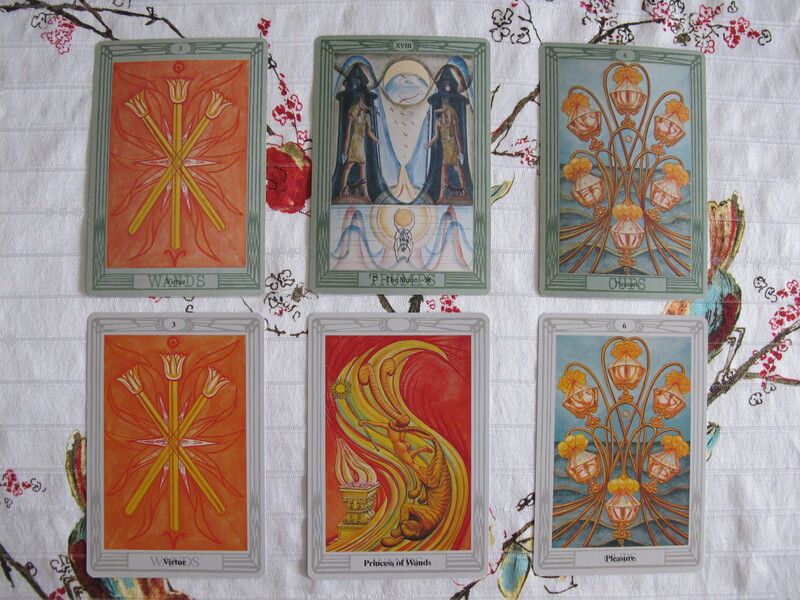 We see this because cards one and three in each spread are the same (see image below). When identical cards appear this way, their importance increases, like the way a recurring dream arrests more attention than one with a single occurrence. Carrot on a String: Starting at the end for practical purposes, the third card of each spread is a “freebie” in that it is an automatic result of the work of the spread. Both Moon and Sun are fervently luring us into the work with the 6 of Cups. 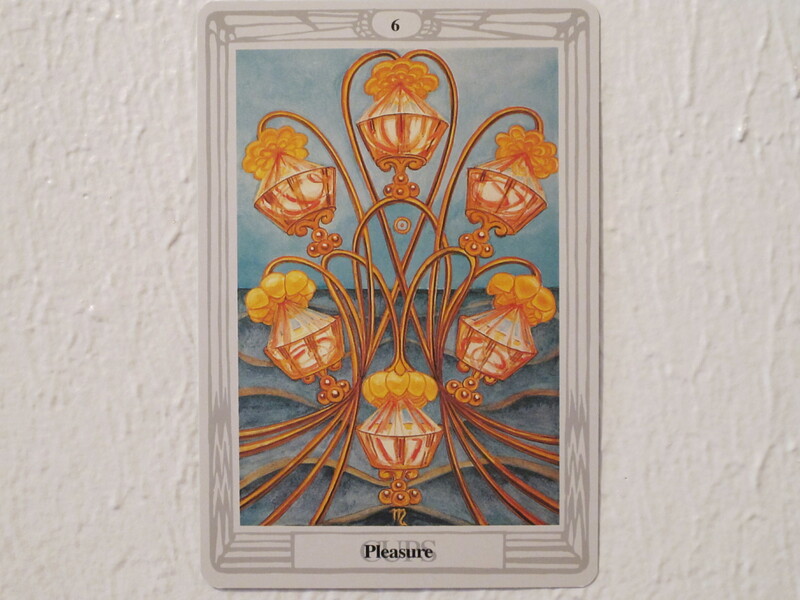 In this card, six golden lotuses fill six dancing golden cups with water from the ocean of whole-hearted fulfillment. Whole-hearted fulfillment comes neither easily nor often, as the attainment of it requires the heart’s participation. Unfortunately, many hearts have gone silent after not being included in daily life due to desire for conformity, or due to oppression. Nevertheless, the result of both spreads is not only a heart that re-connects to life, but also finds itself leaping with joy at the result. Interpretation: This New Moon, together with this Vernal Equinox, support the heart in its work to reclaim its fragments that are stuck in the past by way of looking at some shady parts of the Self. The 3 of Wands card has appeared showing three lotus wands united at the center with a blowing flame moving them forward from behind. There is a unity of three . . . somethings. 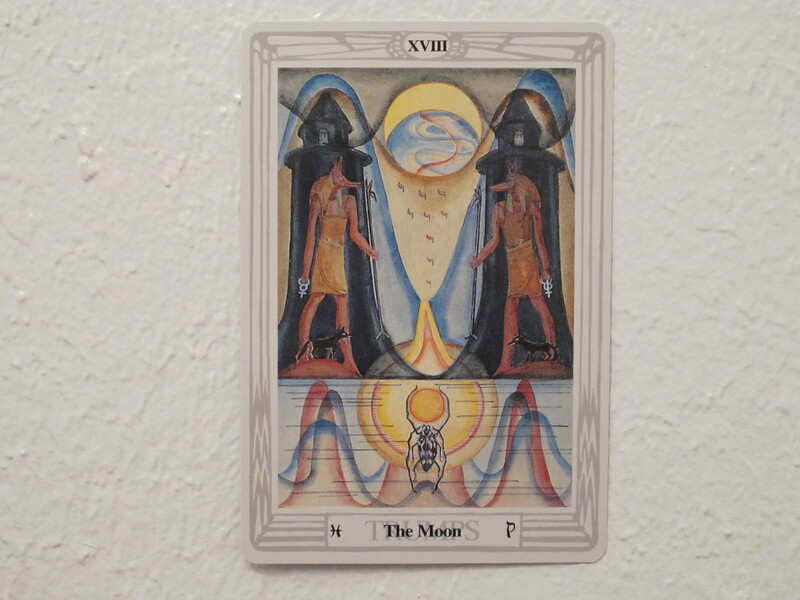 Considering this card is paired with Trump card XVIII – The Moon to its right, let’s settle on unity of past, present and future, with a particular emphasis on retrieving the self from places it became fragmented in the past. To better understand how to open the prison door and release the self from events of the past, Trump card XVIII – The Moon appears. This card refers to the night travels that instead of being clearly lit by the sun, are dimly lit by the moon, and are therefore more dangerous. Night travels symbolize journeys one goes on that have not been well traveled by either the collective or the self. There are some shady spots, in the context of this reading, there are spots where the self scatters vital energy lamenting about a past trauma or disappointment. Why does the soul lament and pile up mountains of negativity there? What are the other options? Do those options arise from one’s own values and introspection, or are they cliches and platitudes? When an authentic option is in place, then the forward moving, united feeling of the 3 of Wands will be there. Summary: This Vernal Equinox, together with this New Moon on the same day, support the heart in its work to go forward as one united being, by way of standing as close to “the flame” as possible without melting away the unique qualities of the personality. Interpretation: As previously stated, the 3 of Wands has importance as it has appeared in the same position for both the New Moon spread and the Vernal Equinox spread. 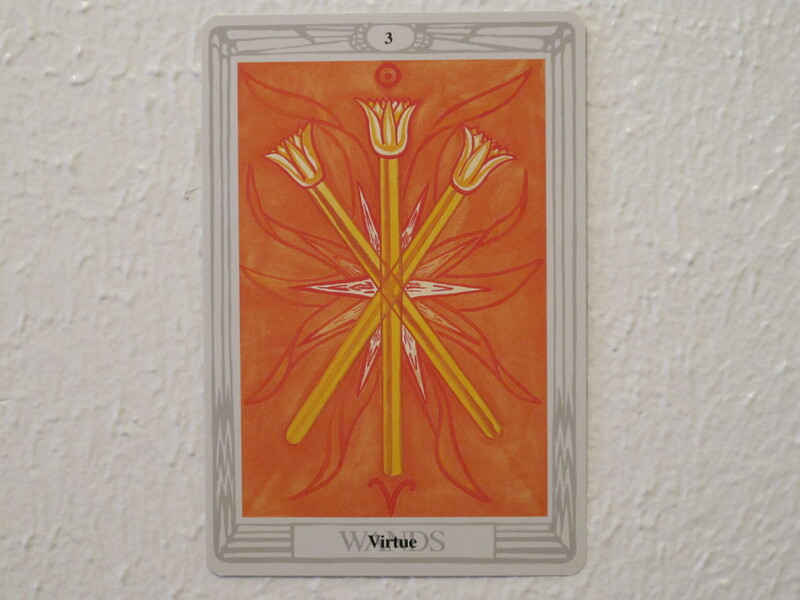 For the Vernal Equinox, the 3 of Wands positioned with the Princess of Wands to its right shows that the fire of the self burns with inspiration when its components are working together in unity towards the creative (Aries) and expressive (Sun) intentions of the heart. In the card’s image, the Princess of Wands ascends in a flame while admiring an altar on which a fire burns. Her tiger’s head crest affirms that her exotically unique qualities are intact and in harmony with her overall direction. How close can one stand to the source of bliss while discovering and retaining one’s own individuality? How passionately can one embrace individuality without losing touch with a greater alignment? There is an art of balance here, to explore with Solar support and the repeated reminder that the automatic reward shown in the third card is the beautiful feeling that the heart is leaping with joy.